Q. I know that TimePilot Central displays an employee's name in red when it thinks there's a problem with the employee's clock-ins and clock-outs—for instance when it sees two clock-ins in a row, the employee probably forgot to clock out. Is there some quick way to see exactly when the software thinks the mistake was made? white space all the way down the screen. If that pattern is broken—you see two triangles or two white spaces together—that's probably where the error is. Also, because it's impossible to calculate an employee's work hours with two straight clock-ins or clock-outs, the software will also insert an "X" in the "Daily" column in TimePilot Central. Once you find the error, you can insert the missing in or out transaction using the "Insert IN" or "Insert OUT" buttons at the top of the TimePilot Central screen. Q. We use TimePilot Vetro and one of our employees lost his iButton. We're in the middle of a pay period and I am worried about losing existing information. Can you please provide me with the steps on how to remove his old iButton and replace it with the new iButton? Open the clock's administration menu by pressing 99, then OK on the clock's keypad. Enter your clock's administrative password. Select option 4 (Assign iButtons) from the menu that appears on the clock's screen. A list of employees will appear on the screen. Scroll down to highlight the appropriate employee, then touch the new iButton to the "In" probe on the clock. The clock will read the iButton number and assign it to the highlighted employee. 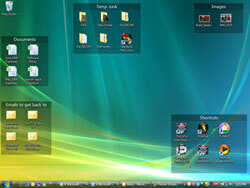 Finally, exit the clock's administrative menu by pressing the Esc key two times. The employee can use their new iButton immediately and there will be no disruption to the TimePilot database on your PC or server. Q. I am running a Vetro clock on our network. When an employee clocks in or out, I'd like the clock to display the number of hours the employee has worked in the current workweek. Is there a setting I need to enable for this feature? Vetro Data Manager must be running. The user must use their four-digit id to clock in or out. If you meet these three requirements, the employees' hours will be shown automatically. Q. Yesterday, my Vetro clock was working fine; today it's showing a date in January 2002. What's going on? A. That's an indicator that power to the clock was interrupted at some point overnight. You'll need to reset the time on your clock. Attaching the clock to your local area network. When the power comes back, the clock's time is automatically synchronized to the time on your network's server. Using an Uninterruptible Power Source (UPS). These battery backup devices keep power flowing to the clock even if your local power supplier has an outage. For more on UPS systems, see our May 2011 newsletter. Meet you by the clock at 5... or 5:30...: Before standard time was adopted by U.S. railroads in 1883, time was mostly a local thing. Most cities and towns kept time by means of a well-known, fairly accurate clock, such as one found in a church steeple or a jeweler's window, but time could vary from town to town anywhere from a few minutes to as much as a half-hour or more. A time for karma: In September 1999, the West Bank was on Daylight Saving Time while Israel had just switched back to standard time. West Bank terrorists prepared time bombs and smuggled them to their counterparts in Israel, who misunderstood the time on the bombs. As the bombs were being planted, they exploded—one hour too early—killing three terrorists instead of the intended victims: two busloads of people. TimePilot Tips: Worked hours displayed in Vetro; tracking employees' breaks. TimePilot Best Practices: All About Alerts. The Deal: Our 20-20 deal: $20 off Vetro and 20% off iButtons. You’ve got your system set up and it’s running well. You’re extracting your pay periods, running reports and perhaps exporting your data to your payroll service or software. Now you’d like to learn a little more. Are there any “secret” features in TimePilot that might make it even more helpful? Yes, there are. This one isn’t too secret—it’s described in the online Help in the TimePilot software—but it can be extremely helpful. It's called "Alerts." When you’re looking at TimePilot Central, there’s a lot of data to wade through. Wouldn’t it be nice if the software could flag you when any employee worked overtime or if an employee’s total number of hours was approaching overtime territory? It can. And it can do even more. You can have the software look for eight different categories, and have any instances of any of the eight flagged in a different color. To set an alert, click the checkbox next to your preferred category, then enter the number of hours that should trigger the alert. Remember that TimePilot uses hours and hundreds of an hour instead of hours and minutes, so, for instance, if you want to enter 8 hours and 30 minutes, you’d enter 8.5 hours. For a handy downloadable chart that converts minutes to decimals, click here. Finally, click the “Change Color” button to choose a tint. We suggest the lighter colors in the top half of the chart—if you choose a dark color, the tint will obscure the black numbers. The task: You’d like to see at a glance when employees worked overtime. The background: You pay overtime to anyone who works more than 8 hours in a day. Open the “Alerts Setup” box as described above. Click the second checkbox from the top (“Highlight Daily Totals greater than or equal to”). Click the “Change Color” button and choose a color for the tint. We’ll choose yellow. Click OK to return to TimePilot Central. Now, in the “Daily” column in TimePilot Central, anyone who worked 8 hours 1 minute or more is highlighted in yellow. Don’t see a column marked “Daily”? No problem. Right-click on the row of column headers at the top of the Transaction List. (The row will be green if you’re in Current Transactions or yellow if you’re in a Past Pay Period.) Click the checkbox next to “Daily” to have those totals show up. The task: You’d like to see at a glance anyone who worked overtime on a day and anyone who is approaching overtime territory for the week. The background: You pay overtime to anyone who works more than 8 hours in a day or anyone who works more than 40 hours in a week. Repeat Steps 1-4 in the previous example. Click the third checkbox (“Highlight Weekly Totals greater than or equal to”). Enter a number of hours in the time field. In this case, we just want to be alerted when an employee is approaching OT status, so we’ll enter 36.00. When an employee hits 36 hours for the week, his or her weekly total will be tinted. Click the “Change Color” button and choose a color for the tint. We’ll choose green. Now in the “Daily” column in TimePilot Central, anyone who worked 8 hours 1 minute or more is highlighted in yellow and anyone who exceeds 36 hours in a week is highlighted in green in the “Weekly” column. Don’t see columns marked “Daily” or “Weekly”? No problem: Right-click on the row of column headers at the top of the Transaction List. (The row will be green if you’re in Current Transactions or yellow if you’re in a Past Pay Period.) 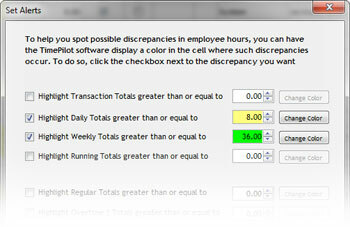 Make sure there’s a check in the checkbox next to “Daily” or “Weekly” (or both) to have those totals show up. Choose a Vetro timeclock system for $329 (regularly $349) and take 20% off iButtons!